If visiting Trondheim, Norway with toddlers or young children, don't miss the Trøndelag Folk Museum. The open-air museum features over 60 buildings from Trondheim and the Trøndelag region, divided into urban and rural sections. We enjoyed visiting the historic buildings in the natural setting, and our 2 year old loved running in the open spaces, and visiting with the resident pigs, sheep, rabbits and other animals. The Visitor Center features exhibits of more modern-day life in Norway. Covering 75 acres, a visit to the Trøndelag Folk Museum involves a fair bit of walking and several hills, so a stroller or carrier is highly recommended if you are visiting with a baby or toddler. With Easter coming up, it seemed a good time for a reminder to those planning travel to the U.S. with kids. A popular Easter basket treat, Kinder Surprise Eggs, are banned from sale or import into the U.S. and you can face a fine if you are found with them. In January 2011, a Winnipeg woman crossing the U.S. border was selected for a random vehicle search. 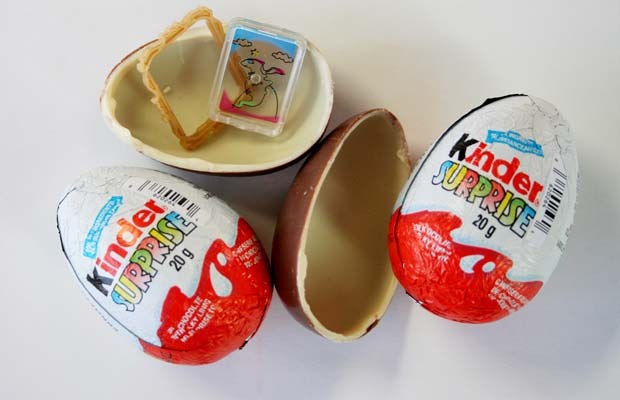 On finding a single $2 Kinder Surprise egg, the customs officer seized the egg as illegal contraband and she was warned she could have faced a $300 fine. Afterwards, the U.S. government sent her a seven-page letter asking her to formally authorize the destruction of her seized Kinder egg, adding if she wished to contest the seizure, she’d have to pay $250 for it to be stored while the parties squabble over it. According to a CBC news story, U.S. officials claim to have seized over 25,000 Kinder eggs in the course of 2,000 separate seizures, so this clearly isn’t a one-time occurrence. The Kinder Surprise eggs were launched in Italy in 1972 but have never been approved for sale in the U.S. The U.S. Consumer Product Safety Commission determined Kinder Surprise eggs did not meet the small-parts requirement for toys for kids under three because of the choking hazard (oddly, Cracker Jack popcorn has never been subject to the same ban). In Canada, Kinder eggs are permitted because it was determined the plastic container actually holding the toy is far too difficult for a child under three to get into. So, if you are traveling to the U.S., stay on the safe side and leave your Kinder Surprise eggs at home! With several distinct 'neighbourhoods' including the Boardwalk and Central Park, the variety of restaurants and entertainment options, and the sheer size of the ship, you can't help but be 'wowed' by the experience. 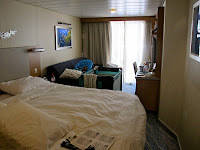 Our stateroom overlooked the boardwalk area at the aft of the ship. It was the perfect location, particularly since I was staying in the room solo with B. During naps and at bedtime, I could go out on the balcony with the baby monitor*, a drink, some snacks and a book and enjoy the activities on the boardwalk. 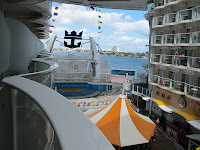 From the balcony, I had the perfect vantage point from which to enjoy the diving shows, movies under the stars, and all the excitement and activity taking place on deck. And because the balcony is facing into the ship, I was less affected by windy weather. With a Broadway production of Hairspray, diving shows in the unique AquaTheater, comedians, parties, parades, big screen movies and a wildly entertaining ice show, there are lots of options for your time. At seven months old, much of the entertainment on offer on our cruise was not really suitable for B, but the ice show offered a more casual family experience and he enjoyed sitting on my lap and watching the action. Since our cruise, Royal Caribbean has added even more kid-friendly entertainment options with their DreamWorks Experience, offering character dining, parades, and meet and greets. With over two dozen dining options including a cute 1940's-style cupcake shop, Johnny Rockets, other specialty restaurants and the main dining rooms, there were no shortage of dining options, and all the food was excellent. All the buffets, cafes and restaurants have plenty of options for kids, and the kid's dining room menu was chock full of healthy options including veggies and dip, fruit and pasta (including macaroni and REAL cheese). At the time, B was mostly nursing, but it was easy to find finger snacks like fresh fruit and cheese at the Windjammer cafe. From the waiters to the stateroom attendants, to the medical facilities and even the ship's on board security screeners, everyone was friendly and extremely helpful. Royal Caribbean allows parents to pre-order baby food, diapers, wipes and other items in advance of the cruise and have them delivered to your stateroom. While the prices are unquestionably high, it's a handy option particularly if your bags are already overflowing with baby gear. Oddly, unlike other Royal Caribbean ships like the Explorer and the Jewel, some areas on the Oasis felt cramped. Too many tables were placed in the Windjammer Cafe, so many so that when the tables closest to the buffet were occupied, it was difficult to find a space to get to the tables behind them. Even with the pack n' play folded up, the state room felt tight - I always felt like I was climbing over the bed every time I needed to get to the couch. Increased ship size brings increased security concerns. Each time we boarded the ship, we had to go through airport-style security including similar restrictions on liquids. 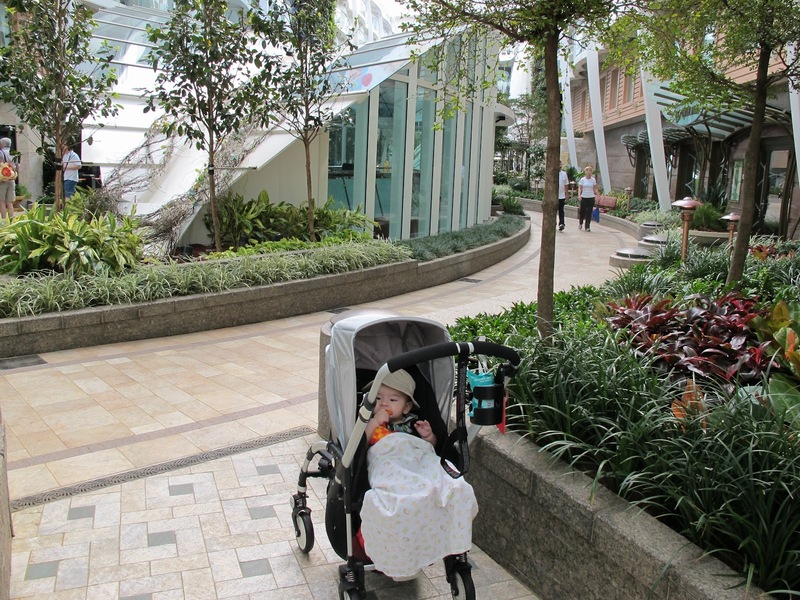 So each time we boarded, I had to collapse the stroller to put it through the x-ray machine, and we had to throw out any water or other drinks we were carrying. Having traveled on a small Hurtigruten ship over Norway's choppy North Cape, I was surprised to find the motion much more pronounced on the Oasis. But like all cruises, obviously the amount of motion is weather-dependent. Because of the size of the ship, it generally has to dock at more modern (and deeper) ports further out of town, so in St. Thomas and St. Martin, rather than being able to walk, a shuttle or taxi was required to get into the town center. In Nassau, we were able to use the port right downtown. The bigger the ship, the longer it takes to walk from one end of the ship to another, which was a bit of a challenge for my not-very-mobile parents. 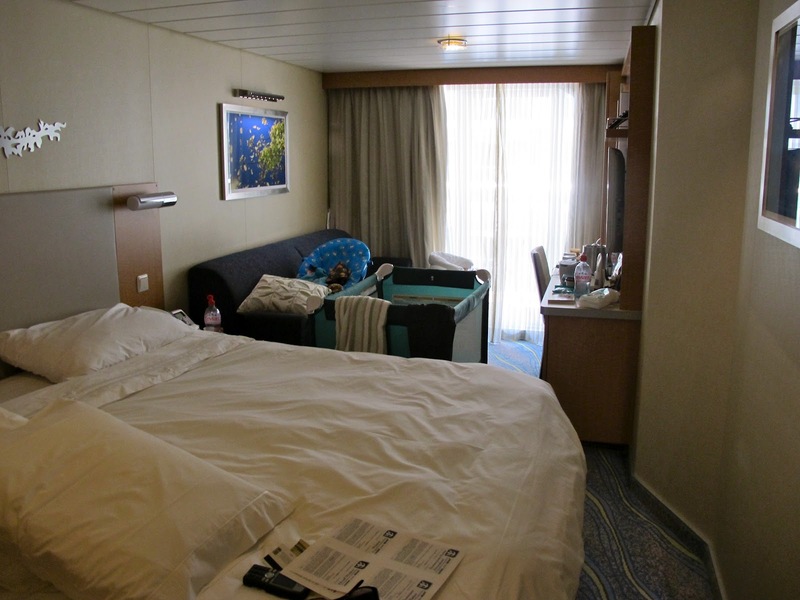 It made for great exercise, but I also had to plan ahead a bit more (and make sure I always had the diaper bag) when wandering around with B, as there was no such thing as a quick trip back to our stateroom. That said, the designers did a fantastic job on signage and interactive map boards so it was always easy to figure out where you were and how to get to where you wanted to go on board. The Oasis is one of the few ships in RCI's fleet with a fully-equipped nursery to care for children under three, and I took advantage of it for a brief visit while I checked out Hairspray with my parents. Their Adventure Ocean facility has a full stock of books and toys in their toy lending program, which meant there was always something new for B to play with and a few less things to bother packing. 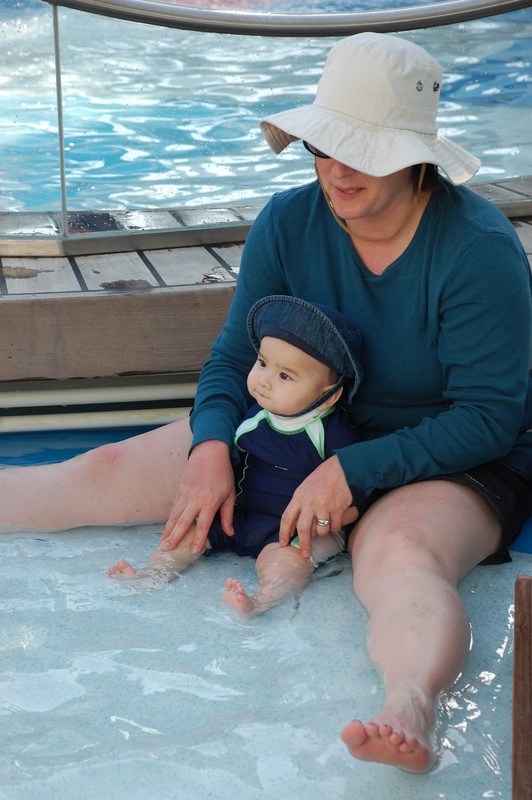 Be warned babies in swim diapers are only permitted in the infant wading pool which was about 2 inches deep so it may be disappointing if you are used to taking your baby or toddler to the pool. The Boardwalk 'neighbourhood' features a full-sized carousel and a Pets at Sea shop. Older kids will enjoy the kids pools, surfing on the FlowRider, zip-lining, mini golf, ice skating, rock climbing, basketball court and the bowling alley. Not to mention all the organized Adventure Ocean activities for kids three and up. Even the most jaded young traveler would have a hard time growing bored on this ship. Read about all of the features for kids and families. I'm a sucker for beds with mosquito nets, and B enjoyed reading and doing crafts in his own little 'fort.' We loved our bungalow at the Mayaland Hotel in Chichen Itza. You can't ask for a better location - just a short walk to the Chichen Itza Archaeological site, gorgeous grounds and refreshing swimming pools! I can't help but get as excited as B when seeing an animal for the first time, particularly when my only knowledge of the animal is from an episode of Go, Diego, Go! Such was the case on our visit to the archaeological site of Tulum, near Cancun, Mexico when we were treated to a sighting of a Coati Mundi. Learn about Coati Mundis. Tulum is the site of what was once a Mayan walled city in a gorgeous location on the Caribbean Sea. The site itself is located about 1 km from the parking lot. I had left our stroller at the hotel thinking the terrain would be too rough for it, but just a few minutes into the walk, I regretted my decision. With the exception of a few areas at the top of the ruins where carrying the stroller would have been required, the site is actually very stroller-friendly. 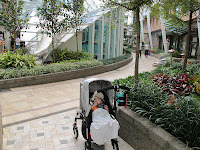 And, given the walking distance required, a stroller (or comfy carrier) is definitely recommended if you are visiting with a baby or toddler. Toddlers may not be particularly interested in the Mayan ruins but the site offers a tram ride between the parking lot and the site (always a hit with kids) plus acres and acres of well-tended lawns to run around on. And while the kids are chasing birds, feeding iguanas and sneaking up on Coati Mundis, you'll have plenty of time to enjoy the ruins. On our recent trip to Cancun, I contemplated taking B for a swim with a dolphin. Would it be worth taking a 2 1/2 year old at $80 USD each? Would B even enjoy it? What if he is too scared to take part? Would there be any danger? Over the course of our holiday, we ended up at La Isla Shopping Center no fewer than four times. Once, for a visit to the Interactive Aquarium. Another time for lunch and to do some souvenir shopping and other times, simply to relax, enjoy a stroll, and get a refreshing iced coffee from Ah Cacao. On our first aquarium visit, I kept a close eye on the dolphin program to see if there were any other little kids participating, and to get an idea just what to expect. During lunch at Jugo de Limon, you can actually get a table perched over the dolphin pool which allowed us to watch more dolphin interactions, and kept B entertained through our meal. We watched many small children (about 2 years old and up) participating and enjoying themselves. I got into the custom of carrying our swimsuits with us wherever we went, and on our fourth visit to the mall, decided "Let's go for it!" Mark isn't a big water fan, so he remained on the overhead viewing area to take photographs while B and I got ready for our dolphin encounter. To start off, we headed over to the seal enclosure for a photo opportunity. To my surprise, B wasn't the least bit phased by getting a big kiss on the cheek from the huge, friendly seal. We were given a short safety and information briefing and then the group was divided into those taking part in the Educational experience (what we did), and those taking part in the more expensive Advanced program which involved actually swimming alongside the dolphins. After a quick trip to the change room and a shower, we were fitted with life jackets (lots of toddler-sized jackets available) and into the pool we went. For the next 45 minutes, we were able to pet, feed, splash around and interact with our new friend, Yakuun. Again, to my surprise, B wasn't the slightest bit afraid of Yakuun and couldn't wait to pet him again and again. When the opportunity came for a get a picture of Yakuun 'kissing' him on the cheek, B planted a kiss right on Yakuun's lips! The aquarium's photographer snapped photos through the whole experience. After the swim, you exit via the gift shop where you can purchase photos (prints or on DVD) if you choose, but be warned, they are pricey at $25 each. Those entering the pool are not permitted to bring cameras for safety reasons, but those not taking part are permitted to take photos from the overhead viewing area, or even from the pool deck from behind a short wall. The aquarium itself is not a huge place, but it is lovely, clean, well-maintained and fun. B especially enjoyed the shark tank, the sea horses and the wonderful turtle and ray tank where he could stand right next to the glass as the creatures sailed by. Our dolphin experience definitely was a splurge, but the trainers were fantastic, the experience was fun, professional and worth every dollar. It remains one of the most memorable experiences from our holiday.